LAVIV is an injectable that is made from your own skin cells. 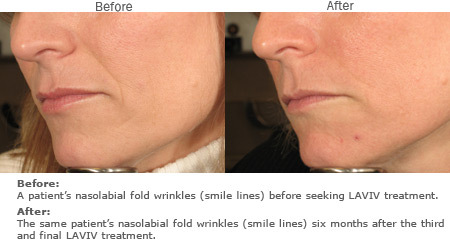 It has recently been approved by the FDA for the treatment of nasolabial folds (smile lines), which can extend from the sides of your nose to the corners of your mouth. Unlike most facial fillers, which typically contain hyaluronic acid, poly-L-lactic acid or collagen, LAVIV is custom-made using your own fibroblast cells. These cells are responsible for the production of collagen and elastin, two proteins that help make your skin supple, elastic and youthful looking. LAVIV was developed by Fibrocell Science of Exton, Pennsylvania. Although initially approved for smile lines, LAVIV may eventually be used for reducing the size of pores, treating acne and burn scars, and improving the appearance of the hands and cleavage. 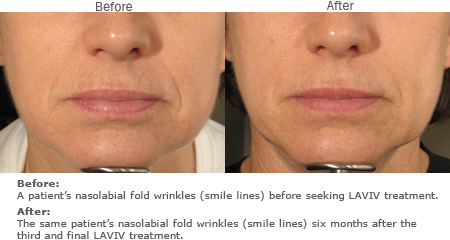 You may be a candidate for LAVIV if you are troubled by smile lines and are otherwise in good health. You should not get LAVIV if you are allergic to certain antibiotics, the chemical dimethyl sulfoxide (DMSO) or products made from cattle. People with skin infections of the face are also not good candidates for LAVIV. If you are interested in LAVIV, your first step is to schedule a consultation with a qualified facial plastic surgeon or dermatologist who has extensive experience with various facial injectables and has been trained to administer LAVIV. Choosing the right practitioner to perform your LAVIV treatments can be an anxiety-provoking experience. With so many injectable providers promoting themselves as qualified medical professionals, it's hard to know who is truly qualified to perform this procedure. We at All About Facial Rejuvenation hope to take some of the stress out of the process and help ease your mind by providing a directory of highly trained facial plastic surgeons. Start your search for a LAVIV provider in your area by clicking on the Find a Surgeon button in the upper right corner of this page. If your doctor decides that you are a good candidate for LAVIV, he or she will take a sample of skin cells from behind your ear. The doctor may numb the area before removing the cells to minimize any discomfort. The sample cells will then be sent to a laboratory, where they will be used to grow more cells, a process that can take up to three months. Once the new cells are ready, they will be placed in a mixture of water and salts and sent to the doctor, who will then administer your LAVIV injections. LAVIV is injected directly into the skin via a small needle to fill in your nasolabial folds, also known as smile lines or parentheses. Treatment with LAVIV typically requires three sessions at three-to-six-week intervals. Results may not be apparent until the final treatment and last about six months, at which time retreatment will be necessary. The good news is that once your cells are harvested, there is no need to repeat that step of the process. If your bank of cells runs low, your LAVIV provider can simply order more cells to be grown in the lab. Although LAVIV uses your own cells, other substances — including antibiotics, bovine serum and dimethyl sulfoxide — are used during the processing of the cells. Trace amounts of these ingredients may remain in LAVIV and can cause an allergic reaction. Infection and injection site reactions such as redness, bruising, swelling and pain can also occur following treatment with LAVIV. One downside of LAVIV is the wait time required for the growing of cells. LAVIV is not for you if you are looking for instant results. Because it is a new product, the precise cost of LAVIV is not yet known. It will likely cost $1,000 to $2,000 to create your personalized bank of fibroblast cells. Each injection session will probably cost between $700 and $1,000. Thus, the total cost may range from $3,100 to $5,000. If the cost of LAVIV is too high for you, ask your doctor about financing plans. LAVIV is not covered by medical insurance.